It is a tradition on my mother's side of the family for the ladies to be gifted with a tea set for their 21st birthday. My favorite teacup is a cup from that set. The teacups, teapot, saucers and cake plate are white with gold trim and painted with purple and blue flowers. The teapot to this set can be seen here. Since we are of British descent, the tea sets in the family made their way to the U.S from the ancestral homeland across the pond. My mother traveled to London when I was a senior in high school purchased two identical tea services for eight, one set for me and one for my cousin Tiffi who is just a few years my junior. Tiffi and I both love purple and this set was the obvious color choice. No expense was spared to see that the delicate pieces arrived in the colonies without being damaged. It wasn't until a few years later my mother and I discovered the very same tea sets could be purchased in the states. When my mother visits us in Arizona we often see this pattern among the antiques in the downtown Mesa shops. We have a good laugh. At least I know I can pick up the odd piece in the event of an accident. What a lovely family heritage. Thanks for sharing. What a lovely tradition! The story behind your tea set is beautiful and you'll always remember the special efforts your mother made to obtain this set for you. How interesting that you are finding pieces of this set in the USA now. I've never seen this pattern --- it is very, very pretty. 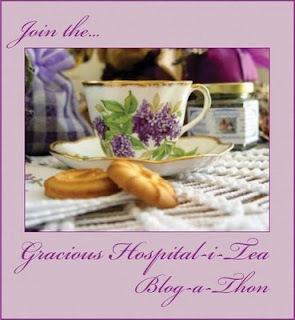 Thank you for sharing in the Gracious Hospital-i-Tea Blog-a-Thon. I look forward to your future posts as well. That's a marvelous tradition! It would've saved me a lot of grief about gifts...it's probably not too late! And, it's a wonderful set...very pretty. I'm glad that you'll be able to find replacements without sending your mother back to Great Britain! I love the colors in your tea set. What a fun story to go with it. I love the story of your tea set. Thanks for sharing!